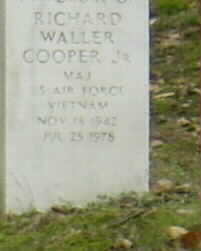 Richard Waller Cooper, Jr. was born on November 18, 1942 and joined the Armed Forces while in Salisbury, Maryland. He served in the United States Air Force, 307 STRAT WG, Battalion SQUADRON, and attained the rank of Major. Richard Waller Cooper, Jr. is listed as Missing in Action. NOTE: Major Cooper's remains have been identified and returned home. He was buried in Alrington National Cemetery on Friday, 19 December 2003. Click here for more information. Thirty-one years to the day after Major Richard W. Cooper Jr.'s B-52 went down in flames over Hanoi and four of his crew mates were captured, his remains -- finally identified -- were buried yesterday in Arlington National Cemetery. "I still love him, and I miss him," Cooper's sister, Connie Saxton, 63, of Salisbury, said last night. "I think of him very often, but it's particularly sad at this time of the year. He was only two years younger than me, and we were very close." For years, the Salisbury man and one of his crew were listed among the thousands of soldiers missing in Vietnam, leaving friends and family to wonder what had happened after the men's bomber was downed by a surface-to-air missile. Four other crew mates were taken prisoner and paraded in front of news cameras. They were released after 101 days. But for decades, there was no word of Cooper. In recent months the Defense Department used mitochondrial DNA testing to identify the remains of Cooper's crew mate found near the site of the crash. Yesterday, the military announced publicly that it had found Cooper, whose captain's stripes where found in the wreckage. "We were elated," said Mildred Alexander, the wife of Fernando Alexander, the plane's radar navigator. "It brought closure to a long-standing wound." From her home in California, Mildred Alexander said that the four surviving members of the crew had remained close. One died about a year and a half ago, she said. The three living survivors of the crash, including her husband, traveled to Arlington yesterday for Cooper's memorial. In October, Fernando Alexander went to Louisiana to attend services for Chief Master Sergeant Charlie Poole, the other crew member whose remains were identified. Members of Cooper's family also attended, standing by as a B-52 flew over the funeral service. Cooper's daughter, Jennifer, born five months after her father was declared missing, gave a eulogy. "It was a very moving ceremony," said Jonathan Cooper, Richard Cooper's younger brother, who traveled from Albany, New York, for the service. "She made it very personal -- about trying to know her dad, even though she never knew him, ... about how much she honored her mother for raising two daughters single-handedly and about just how proud she was of the sacrifice he made for his country." Although the formal ceremony at Arlington yesterday may have given closure, there have been hints for years that Poole and Cooper did not survive the crash -- the second B-52 downing of the "Linebacker II" air offensive, President Richard M. Nixon's attempt in the waning days of the war to bomb the North Vietnamese into peace negotiations. As early as the mid-1990s, military officials thought they had found the two Air Force men. According to the military, photographs in a Vietnam museum and interviews with Vietnamese informants led U.S. investigators to a pond near Hanoi. In 1995, a U.S.-Vietnamese task force drained the pond and excavated the site, according to the military. There, investigators found the wreckage of the B-52, as well as personal items from the crew and human remains. "The crash site was so large that a second excavation was conducted in early 1996," the Department of Defense said in a release issued yesterday. In that excavation, the military collected more remains. Yesterday, the Department of Defense said that "anthropological analysis of the remains" and "mitochondrial DNA matches" confirmed the identifications of Poole and Cooper. Defense Department spokeswoman Michelle Shortencarrier said last night that she did not know when, exactly, the military performed the DNA testing. Mitochondrial DNA testing is a new technology that can create a genetic profile of a person from bone or hair samples. According to the Daily Times of Salisbury, Cooper graduated from the University of Maryland, College Park in 1965, and joined the military in 1967. Jonathan Cooper said his brother had worked for the Department of Agriculture before he joined the service. By December 19, 1972, Cooper had a 2 1/2 -year-old daughter and another on the way. He had "melded" with fatherhood, his brother said, and was happier than ever. He was also starting to question the war, his brother said. "He tried to be tough and macho on the surface, but he tended to be sensitive and felt things deeply," he said. Cooper was 30 when he died. Name: Richard Waller Cooper, Jr.
Fernando Alexander; Charles A. Brown, Jr. (all POWs released in 1973). Source: Compiled by Homecoming II Project 01 April 1991 from one or more of the following: raw data from U.S. Government agency sources, correspondence with POW/MIA families, published sources, interviews. Updated by the P.O.W. NETWORK. Frustrated by problems in negotiating a peace settlement, and pressured by a Congress and public wanting an immediate end to American involvement in Vietnam, President Nixon ordered the most concentrated air offensive of the war - known as Linebacker II - in December 1972. During the offensive, sometimes called the "Christmas bombings," 40,000 tons of bombs were dropped, primarily over the area between Hanoi and Haiphong. White House Press Secretary Ronald Ziegler said that the bombing would end only when all U.S. POWs were released and an internationally recognized cease-fire was in force. On the first day of Linebacker II, December 18, 129 B52s arrived over Hanoi in three waves, four to five hours apart. They attacked the airfields at Hoa Lac, Kep and Phuc Yen, the Kinh No complex and the Yen Vien railyards. The aircraft flew in tight cells of three aircraft to maximize the mutual support benefits of their ECM equipment and flew straight and level to stabilize the bombing computers and ensure that all bombs fell on the military targets and not in civilian areas. The pilots of the early missions reported that "wall-to-wall SAMS" surrounded Hanoi as they neared its outskirts. The first night of bombing, December 18 and 19, two B52s were shot down by SAMs. Onboard the first aircraft shot down on December 18 was its pilot, LTCOL Donald L. Rissi and crewmen MAJ Richard E. Johnson, CAPT Richard T. Simpson, CAPT Robert G. Certain, 1LT Robert J. Thomas and SGT Walter L. Ferguson. Of this crew, Certain, Simpson and Johnson were captured and shown the bodies of the other crew members. Six years later, the bodies of Rissi, Thomas and Ferguson were returned to U.S. control by the Vietnamese. Certain, Simpson and Johnson were held prisoner in Hanoi until March 29, 1973, when they were released in Operation Homecoming. Capt. Hal K. Wilson was in the lead aircraft of a B52 cell from Utapao. Also on board his aircraft were crew men MAJ Fernando Alexander, CAPT Charles A. Brown, Jr., CAPT Henry C. Barrows, CAPT Richard W. Cooper Jr. (the navigator), and SGT Charlie S. Poole (the tailgunner). Wilson's aircraft was hit by a SAM near his target area and crashed in the early morning hours of December 19, sustaining damage to the fuselage. In the ensuing fire, there was no time for orderly bailout, but as later examination of radio tapes indicated, all six crewmen deployed their parachutes and evidently safely ejected. The aircraft damage report indicated that all six men were prisoner. Radio Hanoi announced in news broadcasts between 19 and 22 December that the six crewmen had been captured. When the war ended, however, only four of the crew returned from Hanoi prisons. Hanoi has remained silent about the fate of Charlie Poole and Richard Cooper. The Christmas Bombings, despite press accounts to the contrary, were of the most precise the world had seen. Pilots involved in the immense series of strikes generally agree that the strikes against anti-aircraft and strategic targets was so successful that the U.S., had it desired, "could have taken the entire country of Vietnam by inserting an average Boy Scout troop in Hanoi and marching them southward." To achieve this precision bombing, the Pentagon deemed it necessary to stick to a regular flight path. For many missions, the predictable B52 strikes were anticipated and prepared for by the North Vietnamese. Later, however, flight paths were altered and attrition all but eliminated any hostile threat from the ground. Linebacker II involved 155 Boeing B52 Stratofortress bombers stationed at Anderson AFB, Guam (72nd Strat Wing) and another 50 B52s stationed at Utapao Airbase, Thailand (307th Strat Wing), an enormous number of bombers with over one thousand men flying the missions. However, the bombings were not conducted without high loss of aircraft and personnel. During the month of December 1972, 61 crewmembers onboard ten B52 aircraft were shot down and were captured or declared missing. (The B52 carried a crew of six men; however, one B52 lost carried an extra crewman.) Of these 61, 33 men were released in 1973. The others remained missing at the end of the war. Over half of these survived to eject safely. What happened to them?